We met up with LumaFusion at the NAB 2018 ShowStoppers event. We were quite impressed. You should know about this option for “mobile” editing using a tablet or even a phone. It is pretty cool. Before we start talking about your video editing solution, can you give me a little background your company and your personal experience in the video industry? LumaTouch was founded in 2013 by Terri Morgan and Chris Demiris. Both Terri and Chris have long careers in the video industry, and their paths eventually crossed at Avid in 2008. Chris, lead developer at Luma Touch, has over 30 years of software engineering experience, specializing in video and GPU video processing technologies. Chris co-founded Hollywood FX in 1993, delivered an award-winning line of 3D video motion graphic products, and sold to Pinnacle Systems in 1999. As part of the Pinnacle Studio team at Pinnacle, Avid and then Corel, he created and integrated numerous technologies and products for 3D motion graphics, GPU video processing, and digital-rights-management. He led the development and release of the highly-successful Pinnacle Studio for iPad (previously Avid Studio). Chris received his BS in Computer Science at Westminster College. Terri, lead designer at Luma Touch, brings 30 years of experience from the video industry to her passion for user experience and design. In 1988 Terri helped usher in the era of non-linear editing as a video editor at Alpha Cine Labs in Seattle. In 1995 she moved to London to become a Product Specialist for Lightworks, one of the pioneers of non-linear editing, and then Tektronix contributing to a multi-track editing system for broadcasters. In 2000, Terri founded her own video editing and consulting business providing design and beta-test management for companies like Fast Multimedia and Pinnacle Studio. In 2007, Terri joined Avid, where she became a Principal Product Designer and led the product management and design of the successful Pinnacle Studio for iPad. Terri received her BA in Visual Communications at The Evergreen State College, and earned a Professional Certificate at the University of Washington in Human Centered Design and Engineering. 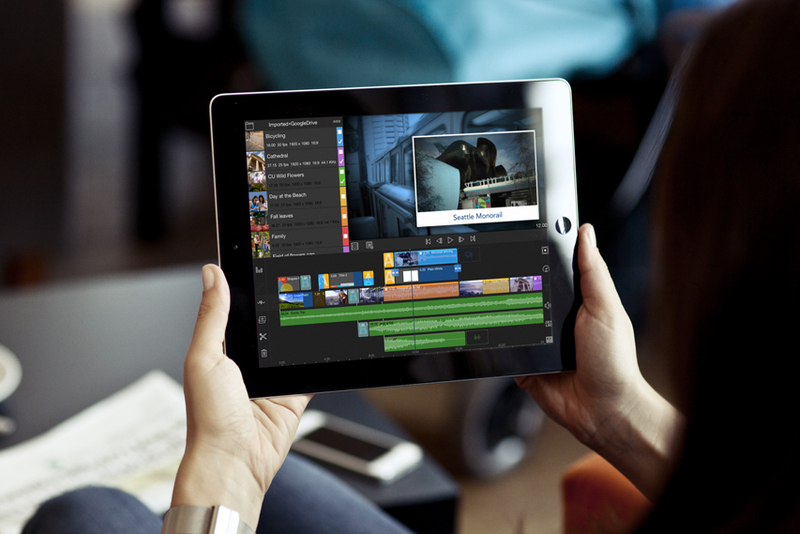 LumaFusion is the first truly professional, multi-track video editing system for iOS. It has become the “go-to product” for mobile video editing, titling, audio mixing, color correction and finishing of high quality video projects while in the field. What video production problems are you solving? 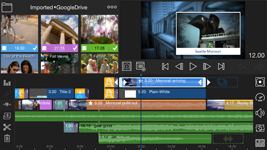 LumaFusion allows editing a complex multi-track story on your device - it supports professional features like Insert and Overwrite mode, Clip Linking for sync management, and allows 3 tracks of 4K media to be added to the timeline. LumaFusion provides quick and direct access to color correction, titling and the ability to add multiple key-framed effects on every clip. LumaFusion supports audio channel mapping. This means you can shoot with two mics (one for background and one for voice) and then separate the stereo file into two mono tracks for independent control over each track. The LumaFusion Titler allows unlimited layers of text, shapes and imported graphics. Custom branded titles can be created, and presets can be saved and shared across devices. Previously, mobile video editing has been confined to template editing, providing little to no custom editing opportunities, and strapping users into “expected” workflows. LumaFusion respects that every project is different, and every creative editor needs or wants to edit in a different way. At the current one-time purchase price of $19.99 (normally $39.99) LumaFusion is a small fraction of the cost of most desktop editors, making it affordable for almost anyone. As the first truly professional video and effects editor for mobile, LumaFusion has been acclaimed by mobile journalists, independent and experimental filmmakers, music video artists and corporate producers as a trusted and easily-affordable solution for creative video editing and effects, rivaling the features and exceeding the usability and enjoy-ability of more expensive desktop editors like FCPX and Adobe Premiere. What are the tech specs and editing features for LumanFusion? What can it do regarding editing video and audio? Western Digital Wireless Pro and other SMB drives. What’s SMB? Shouldn’t any removable drive work? SMB stands for the Server Message Block (SMB) Protocol – and is a network file sharing protocol. External drives using the SMB Protocol will work as a source to import directly into LumFusion without first adding the files to the Photos or Files app on your device. When is the edited video rendered? During the editing process or after the edit decisions have been made? The video is only rendered at the final stage during export. At that time the frame rate and resolution can be selected – during editing we maintain the full resolution and frame rate of your source media. How long does this rendering period take? 1 minute clip, 4K 3840 x 2160, 50mbps, 30fps on a iPad Pro 10.5” device takes 63 seconds to write the file to the photos app. Is it possible to view your edit on a big screen? With our upcoming I/O pack you will be able to see your preview full screen on an external monitor connected to your device either using Apple Airplay or an HDMI cable. As I understand it, the work flow is to input your captured video and audio into your mobile computing device with the LumaFusion software. Obviously, the amount of video that can be stored and edited is limited by the size of device’s hard drive. For example, on an iPad with 128 gig hard drive, how much video can be stored – after allocating space for other software, data, as well as empty space for the edited video. You can get anywhere from 130 – 560 minutes of video into100 GB of storage depending on the frame rate, resolution, and bit rate of your media. I realize that isn’t the concrete answer you might wish for, but the truth is there are a lot of variables, how many apps do you have?, how much data do they use?, and what bitrate/framerate and resolution do you record and export at? While it is true that space on the device must be available for your source media and your exported file, one of the things we have done to alleviate low space is to make a custom integration with Gnarbox, (and soon with Western Digital My Passport Wireless Pro). This integration means that you can preview media on the external drive from within LumaFusion, mark in and out points and drag that media to the timeline. Only the media + small handles is transferred to your mobile device in the background saving space on your device. Does this mean that the project needs to be rendered later? Only as your final export to your destination (the step that combines all the layers and cuts into one file). We do need to have temporary space available on your device to create the file before uploading to somewhere, whether it’s Dropbox or an External Drive. At NAB we announced our Pro I/O pack and integration with Gnarbox. The Pro I/O Pack will include external monitor support (allowing full-screen preview on an external monitor while editing), batch export, background upload/download and .xml project export. The Pro I/O pack will be an in-app purchase for current owners of LumaFusion. The price for the Pro I/O Pack will be $29.99. GNARBOX 2.0 SSD is a rugged backup device for content creators who prefer to travel without a laptop. With single-step backup, dedicated workspaces for photographers and videographers, and integrated access to professional editing software, GNARBOX will save you time and make you a more reliable creator. XML is (Extensible Markup Language) – a computer and human readable text file that saves a timeline of your movie and audio clips, transitions, effects, and other editing information. This file can be opened in other editing software such as Final Cut Pro X and Premiere. In the case of LumaFusion, we actually create a .zip file that contains the xml project AND the media that goes with it. That way the user just extracts the .zip file, and double-clicks on the xml file, and all media is automatically linked up, no extra work. What is next, what is coming for next generation LumaFusion? The Pro I/O Pack is the first of several packs planned for LumaFusion. Each pack will focus on a specific area of editing, bringing LumaFusion closer to desktop editing with each step.